AmFIRST Real Estate Investment Trust (AmFIRST REIT), Malaysia's second biggest property trust by assets, is out to increase its asset size of more than RM1 billion and expects a deal to be done in the current financial year. Its performance will also be driven by the expansion of major tenant AmBank Group and progressive upgrading of existing buildings to attract new tenants. Am ARA REIT Managers Sdn Bhd chief executive officer Lim Yoon Peng said the trust manager also aimed to acquire a few assets in the Klang Valley. "For every asset we acquire, we look at its returns or yield and potential capital appreciation," he said in an interview with Business Times in Kuala Lumpur. The new acquisitions will be funded with cash after which AmFIRST REIT will issue new units to raise funds and cut its borrowings. In Malaysia, REITs are allowed to borrow up to half of total assets. Am ARA is fully owned by Am ARA REIT Holdings Sdn Bhd, which in turn is 70 per cent owned by AmInvestment Group Bhd and 30 per cent by ARA Asset Management (M) Ltd. ARA Asset Management is fully owned by the Singapore-based ARA AmFIRST (Singapore) Pte Ltd.
Lim said ARA Asset Management was actively looking at property acquisitions in Malaysia via its private real estate funds. "Should the fund dispose of these assets in future and the yields are attractive, AmFIRST REIT has the option to acquire them. "This will serve as a pipeline of properties to boost AmFIRST REIT's investment portfolio." As of March 31 this year, AmFIRST REIT is the second largest REIT in the country, after Starhill REIT, in terms of assets under management of RM1.008 billion. Its portfolio comprises office (63 per cent), hotel (13 per cent) and retail (24 per cent) assets. Bursa Malaysia-listed AmFIRST REIT has six properties: Bangunan AmBank Group, Menara AmBank Group and AmBank Group Leadership Centre in Kuala Lumpur; Menara Merais in Petaling Jaya, Kelana Brem Tower in Kelana Jaya and The Summit Subang USJ in Subang Jaya, Selangor. AmFIRST REIT fully owns the properties, except for The Summit, a mixed development. AmFIRST REIT owns the Summit Hotel, nearly 70 per cent of retail space in the mall, and 12 out of 13 floors of the office tower. AmFIRST REIT is repositioning the Summit mall and intends to buy retail lots that fit into its plans. The upgrading works will cost about RM25 million, of which AmFIRST REIT's share will be 70 per cent based on its ownership of the stratified retail mall. "This will be carried out in stages until the end of 2011," Lim said. It will also spend RM3 million to refurbish the Summit Hotel, which will generate additional annual rental of RM200,000. In the financial year to March 31 2010, AmFIRST REIT reported after-tax realised income of RM41.9 million, up 12 per cent from the previous year's. The increase was attributed to new lettings and higher rentals upon renewals. During that period, rental revenue increased 5.5 per cent to RM98.2 million. The property trust has declared an income distribution of 9.75 sen per unit, up 11.4 per cent from the previous year's. Its unit price increased to RM1.10 from 85 sen, a dividend yield of 8.86 per cent. AmFIRST REIT expects to maintain its performance for the financial year ending March 31 2011. "We hope that we can fill up the buildings that have low occupancy. Secondly, as we reposition the buildings, we hope to get more tenants." Lim said the outlook for commercial buildings had become more challenging with the greater supply of new offices in the central business district (CBD). Commercial office rentals may soften when supply outstrips demand given that about 4.2 million sq ft of new office space will be available in future. The annual take-up is around 2.5 million sq ft. However, it is unlikely to hurt AmFIRST REIT as three of its buildings in the CBD are tenanted mainly by AmBank Group, which occupies 78 per cent of the total net lettable area. 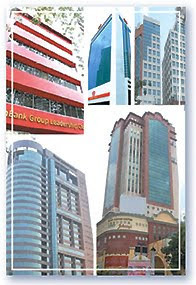 The buildings - Bangunan Ambank Group, AmBank Group Leadership Centre and Menara Ambank - also represent 34.6 per cent of AmFIRST REIT's portfolio. "The average occupancy of these three buildings is 98.2 per cent and, with AmBank Group looking to expand, we should be looking at 100 per cent occupancy soon," Lim said. As at March 31 this year, AmFIRST REIT's borrowing was RM413 million, which is 39.6 per cent of its total assets. AmFIRST REIT, listed on Bursa Malaysia on December 21 2006, has an approved fund size of 429 million units. Its market capitalisation is RM471.9 million based on RM1.10 per unit as at March 31 this year. Perdana ParkCity Sdn Bhd, a subsidiary of the timber-based Samling group, hopes to replicate its successful Desa ParkCity township model abroad, targeting Southeast Asia. The company is looking for landbank of more than 120ha in Jakarta, its group chief executive officer Lee Liam Chye said. "We will form joint ventures with landowners and developers. We think Asia is on an upstream and we are at the beginning of a recovery after a recession. "For me, the sooner we get into actualising our vision to be a regional player the better it would be for the company," Lee said in an interview with Business Times in Kuala Lumpur recently. Perdana ParkCity is now busy with its multi-billion ringgit Desa ParkCity project, which is expected to be completed by 2015. It has a similar project in Hanoi worth more than RM6 billion, which will take eight years to develop. Lee said township development will be the driving force for the company to grow into a regional player. "There are reasonable margins to be made in township development. This year, we are expecting sales of RM650 million from our Desa ParkCity project and the money will be rolled over," he said. Lee ruled out listing to raise funds for expansion. "As a listed company, you are compelled to fix things short term and that does not go well with township developments. In township, we always fix things on long-term consideration," he said. Lee said the company's recent win at the Fiabci World Congress in Bali, where it bagged the Fiabci Prix d'Excellence Awards 2010 for the Residential (Low Rise) Category, will put the company on good footing. Fiabci is the acronym for the Paris-based International Real Estate Federation. "We have a brand and taking that overseas will be easy for us. The Fiabci award comes at a time when we are looking to expand overseas," Lee said. The award was for Perdana ParkCity's Adiva Parkhomes, one of 13 neighbourhoods at Desa ParkCity. The 4.5-acre gated-and-guarded freehold strata-titled Adiva comprises 78 units of Parkhomes, 66 courtyard terraces and 16 courtyard apartments. They were launched in July 2003 and completed and handed over in April 2006. Perdana ParkCity Sdn Bhd has rescheduled its launching of a billion ringgit township project in Hanoi to the fourth quarter of this year. "We are excited about the project but we pulled the breaks as there is uncertainty in the market place, affecting buying sentiments. "If you want to go to a place like Vietnam, you have to be prepared and the market has to be ready," group chief executive officer Lee Liam Chye said. The 78ha housing project, dubbed ParkCity Hanoi, is valued at more than RM6 billion and was scheduled for July launch. "We are ready to launch but we will wait and see how the market reacts over the next few months," Lee said in an interview in Kuala Lumpur recently. ParkCity Hanoi comprises townvillas, townhouses, semi-detached homes, bungalows, condominiums as well as apartments. It is a replica of the company's ongoing Desa ParkCity township project in Bukit Menjalara, Kuala Lumpur. The township will be developed in 15 phases and include a commercial belt, a community clubhouse, a central park and international schools. It will be developed by The Vietnam International Township Development JSC, in which Perdana ParkCity has a 59 per cent stake. Lee said Perdana ParkCity expects to launch phase one and two of the project by December, comprising 1,200 units of three-storey terraced houses and apartments. The 2,200 sq ft terraced houses are priced from RM1.4 million each and the apartments at around RM750 per sq ft, with sizes ranging from 950 sq ft to RM1,600 sq ft.
"We expect brisk sales when we launch as the Vietnam market is underserved in areas including offices, houses, retail, hotel and industrial. We will be targeting affluent Vietnamese," he said. Lee said the company has taken possession of the land and completed earthworks. KUALA LUMPUR: UDA Holdings Bhd would commence construction to redevelop the Pudu Jail site by the first quarter of 2011 (1Q2011) with the project to be built in stages over 10 years, Deputy Finance Minister Datuk Awang Adek Hussin told the Dewan Rakyat. In a reply to Fong Kui Loon (Bukit Bintang - DAP), Awang Adek said on Monday, June 21 the mixed development on Jalan Pudu in the city centre had been divided into six phases and will be developed over 10 years. Awang Adek added that the decision to stagger construction of the development, earlier named Bukit Bintang Commercial Centre, was made after considering current and projected property market positions as well as economic projections for the next ten years. According to Awang Adek, about 40% of the development would be residential properties while the remainder would be commercial spaces, which would be owned by UDA Holdings to be rented out. The RM5 billion mixed development on the former prison's site will include a transit centre, serviced apartments, a hotel, office spaces, recreation areas and commercial spaces, Awang Adek added.